The forum gathered over 500 delegates from 43 countries, from the Urals and Caucasus, and from the Arctic to the Mediterranean, representing 290 civil society organizations of peasants, fishers, pastoralists, indigenous people, consumers, trade unions, environmental justice, solidarity, human rights organizations, community-based food movements, journalists, and researchers working for food sovereignty in Europe at different levels. Also, representatives from countries outside Europe were present, including Sierra Leone, Cambodia, Jordan, China, Zambia, Mali, Honduras, Zimbabwe, Thailand, Canada, Brazil, Uruguay, Mongolia, Indonesia, and Myanmar. The aim of the forum was to share experiences, develop a common understanding of food sovereignty, share ideas for powerful joint actions, discuss strategies to relocalize Europe’s food systems, and explore how to influence key policies in Europe. The gathering was an important stepping stone for building a strong food sovereignty movement in Europe, especially in Eastern Europe, as well as in several other European countries where no food sovereignty platforms previously existed. The forum was also a first step towards structuring the European movement and giving it visibility through the planning of shared actions. 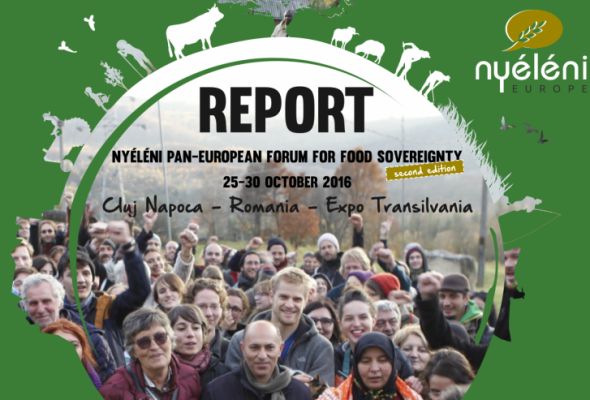 After the closure of the Forum from Romania, at the time of writing this report, many Food Sovereignty platforms are emerging in Eastern Europe and Central Asia.